Buddha statue at Vung Tau, Ba Ria Province, Vietnam. To the wide world, Vietnamese Buddhism may be mostly known for a self-immolating monk of Saigon and the teacher and author Thich Nhat Hanh. There's a bit more to it. Buddhism reached Vietnam at least 18 centuries ago. Today Buddhism is arguably the most visible religion in Vietnam, although it is estimated that fewer than 10 percent of the Vietnamese actively practice. Buddhism in Vietnam is primarily Mahayana, which makes Vietnam unique among the Theravada nations of southeast Asia. Most Vietnamese Mahayana Buddhism is a blend of Chan (Zen) and Pure Land, with some Tien-t'ai influence as well. There is Theravadin Buddhism also, however, especially among the Khmer ethnic minority. For the past 50 years, Buddhism has been subject to a series of government oppressions. Today, some members of the monastic sangha regularly are harassed, intimidated and detained by the ruling communist party. Buddhism is thought to have arrived in Vietnam from both India and China by no later than the 2nd century CE. At the time, and until the 10th century, the territory we call Vietnam today was dominated by China. 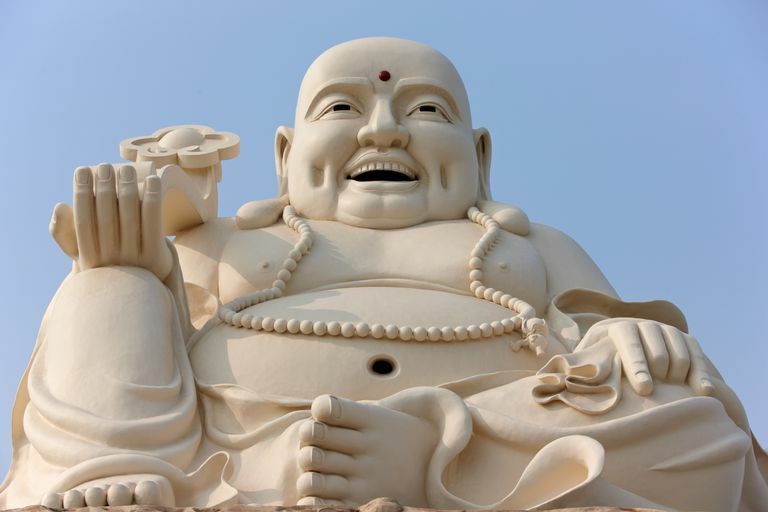 Buddhism developed in Vietnam with an unmistakable Chinese influence. From the 11th to 15th centuries Vietnamese Buddhism experienced what might be called a golden age, enjoying the favor and patronage of Vietnamese rulers. However, Buddhism fell out of favor during the Le Dynasty, which ruled from 1428 to 1788. The next bit of history is not directly about Vietnamese Buddhism, but it's important to understanding recent developments in Vietnamese Buddhism. The Nguyen Dynasty came to power in 1802 with some assistance from France. The French, including French Catholic missionaries, struggled to gain influence in Vietnam. In time the Emperor Napoleon III of France invaded Vietnam and claimed it as French territory. Vietnam became part of French Indochina in 1887. The invasion of Vietnam by Japan in 1940 effectively ended French rule. After the defeat of Japan in 1945, a complex political and military struggle left Vietnam divided, with the north controlled by a Vietnamese Communist Party (VCP) and the south more or less a Republic, propped up by a series of foreign governments until the Fall of Saigon in 1975. Since that time the VCP has been in control of Vietnam. Now let's go back a bit to the Buddhist Crisis of 1963, a significant event in Vietnamese Buddhist history. Ngo Dinh Diem, president of South Vietnam from 1955 to 1963, was a Catholic determined to govern Vietnam by Catholic principles. As time went on it seemed to Vietnam's Buddhists that Diem's religious policies were growing more capricious and unfair. In May 1963, Buddhists in Hue, where Diem's brother served as Catholic archbishop, were prohibited from flying the Buddhist flag during Vesak. Protests followed that were suppressed by the South Vietnamese military; nine protesters were killed. Diem blamed North Vietnam and banned further protests, which only inflamed more opposition and more protests. In June 1963, a Buddhist monk named Thich Quang Duc set himself on fire while seated in a meditation position in the middle of a Saigon intersection. The photo of Thich Quang Duc's self-immolation became one of the most iconic images of the 20th century. Meanwhile, other nuns and monks were organizing rallies and hunger strikes and handing out pamphlets protesting Diem's anti-Buddhist policies. More vexing for Diem, the protests were being covered by prominent western journalists. At the time support from the United States government was keeping Ngo Dinh Diem in power, and public opinion in America was important to him. Desperate to shut down the growing demonstrations, in August Diem's brother Ngo Dinh Nhu, head of Vietnam's secret police, ordered Vietnamese special forces, troops, to attack Buddhist temples all over South Vietnam. Over 1,400 Buddhist monastics were arrested; hundreds more disappeared and were presumed to be killed. This strike against monks and nuns was so disturbing to U.S. President John F. Kennedy that the U.S. withdrew support from the Nhu regime. Later that year Diem was assassinated. America's military involvement in Vietnam had one beneficial effect, which was to give the monk Thich Nhat Hanh (b. 1926) to the world. In 1965 and 1966, as U.S. soldiers were entering South Vietnam, Nhat Hanh was teaching at a Buddhist college in Saigon. He and his students issued statements calling for peace. In 1966, Nhat Hanh traveled to the U.S. to lecture on the war and reach out to American leaders to end it. But neither North nor South Vietnam would allow him to return to his country, sending him into exile. He moved to France and became one of the most prominent voices for Buddhism in the West. The constitution of the Socialist Republic of Vietnam puts the Communist Party of Vietnam in charge of all aspects of Vietnam's government and society. "Society" includes Buddhism. There are two main Buddhist organizations in Vietnam—the government-sanctioned Buddhist Church of Vietnam (BCV) and the independent Unified Buddhist Church of Vietnam (UBCV). The BCV is part of the "Vietnamese Fatherland Front" organized by the party to support the party. The UBCV refuses to join the BCV and is banned by the government. For 30 years the government has been harassing and detaining UBCV monks and nuns and raiding their temples. UBCV leader Thich Quang Do, 79, has been in detention or house arrest for the past 26 years. The treatment of Buddhist monks and nuns in Vietnam remains a deep concern for human rights organizations around the world.